Did you see yesterday’s post about the “You show me yours, I’ll show you mine” stash linky party? I’m so excited to see what people come up with over the course of the next week! But today is all about branching out from your usual stash and using voile and linen blends. Have you tried them yet? I keep seeing people online using voile and linen and I keep wondering: is that ok? Are there any special rules? The central square is voile, two of the tulip leaves are voile, and all of the pink flower stamens on the top row are linen. All of the voile and linen are Anna Maria Horner. I did not pre-wash any of it or change my needle or turn down my iron. I did everything exactly the same as I usually do. I even washed it at the end to make sure everything would come out ok. If the fabrics shrunk at a different rate it’s not noticeable, even where the linen and voile are sewn directly together. 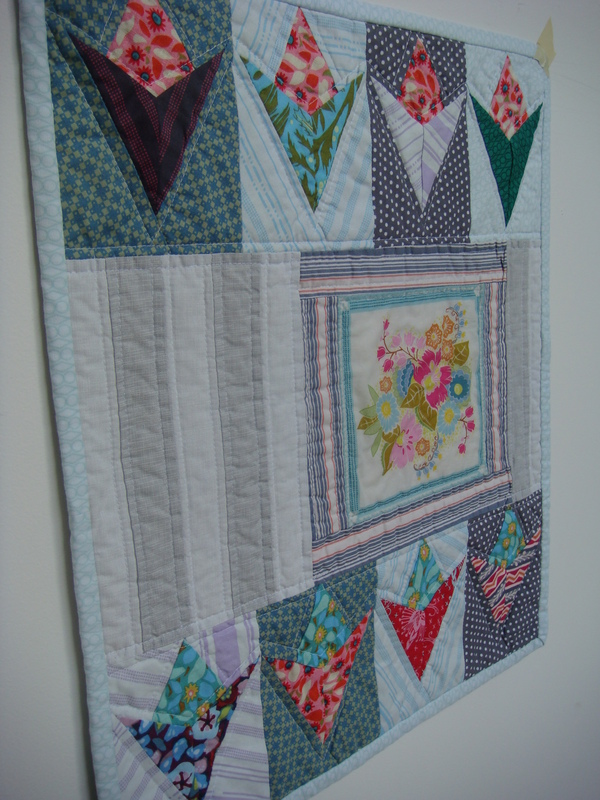 So here’s the bottom line: I think you can use AMH’s voile and linen blend interchangably with regular quilting cotton! Good to know, right? Even though the results were good, working with voile was a bit of a pain. 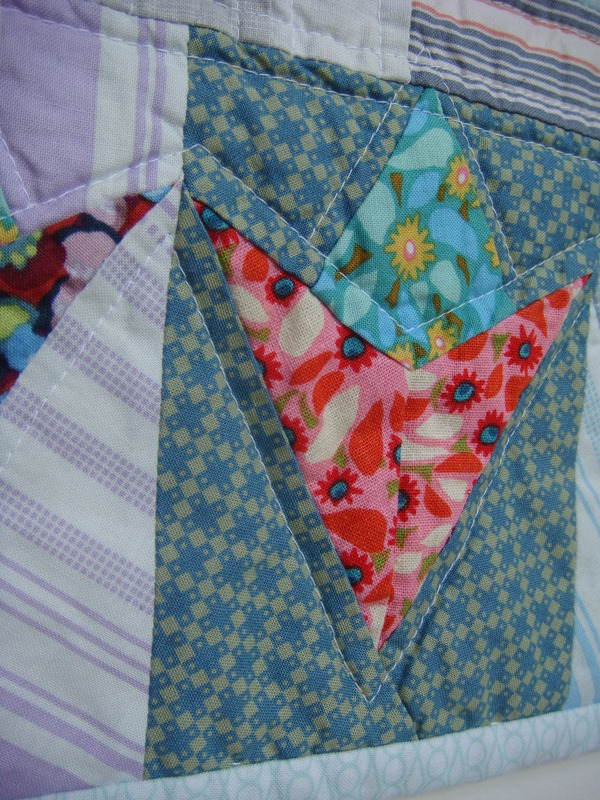 I did not enjoy piecing with it, especially the y-seam for the tulip. On the other hand working with linen was lovely! You know those really close up pictures of fabric that capture the texture you can’t really see with your eyes? With the linen you can see it. I also loved how crisply the seams pressed and I think it would make a nice heavy backing for a winter quilt. They’re more expensive per yard but both come on 54 inch bolts. A fat quarter is bigger than you’re used to! A yard is downright humongous! This entry was posted in Uncategorized and tagged linen, Voile. Bookmark the permalink. ← Theory Thursday: You show me yours, I’ll show you mine linky party! I just turned 50. In my birthday card, one thing my husband wrote was that he loves that I’ve always wanted to be home with our children. I’m impressed that you’ve given up your career to be a “mommy”. It is so worth it now, to have 5 grown children who had a mother home with them, even when they walked in the door from high school (that’s the best!). I admire you . . . and love your wall sampler and the linen. Beautiful quilt. I loved hearing about your experiment with different fabrics. I love linen – it’s one of my very favorite fabrics to wear, and the duvet on my bed growing up was Irish linen – it was so gorgeous and soft and snuggly – I have been wanting to make a quilt with it and you may have just given me enough inspiration to go out and buy some. Thanks, Sarah! Such a pretty little mini! 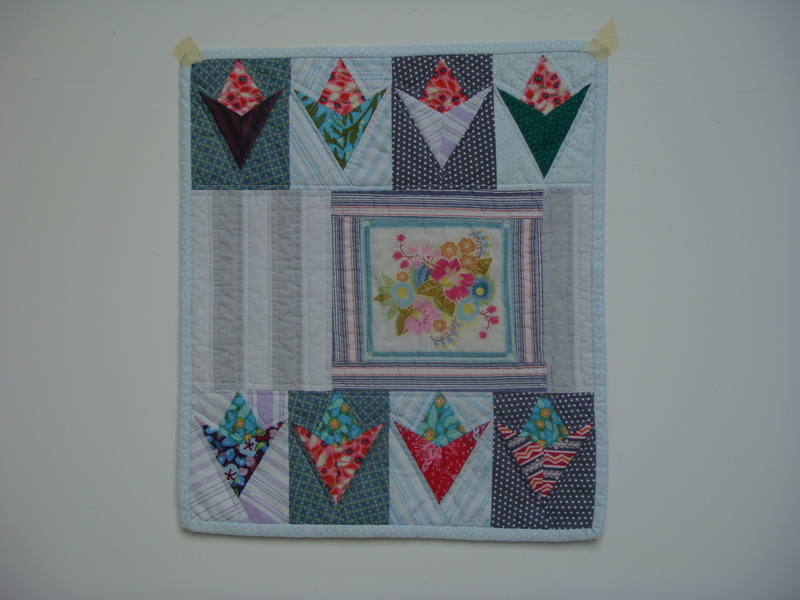 In the past I made a twin quilt with quilting cotton, voile and double gauze large squares, sashed in linen. Pretty quickly the gauze and voiles started coming apart at the sashing. It wasn’t that the sewing came undone, it was that the fabrics themselves unraveled due to the difference in strength/weight between the two extremes. I mix QC and voile and QC in linen, but I don’t mix voile and linen for things that need to put up with heavy use and machine laundering anymore. That’s just my experience! Interesting… I have used linen but haven’t tried quilting with voile. I keep wanting to use it for a quilt back after hearing everyone rave about how soft and light it is. Was it hard to work with because it was so light? Do you think starching would help at all? Wow, your mini is stunning! Thanks for sharing your experience with voile, linen and qc.